After a string of events Deeperfect is bringing its techno and tech house night to the world’s most infamous White Isle, Ibiza, for a series of summer events. Deeperfect will host a total of seven events at possibly one of Ibiza’s most exciting new venues, where an international crowd of techno and tech house lovers will be able to dance with the sand between their toes. No Name Ibiza is located at the south end of Playa d'en Bossa, its foundations in the sand lie between Nassau and Hard Rock Hotel. The beach bar has made a reputation for itself as a popular after-party venue, hosting the likes of Luciano, Richie Hawtin, Sven Vath, tINI, Ricardo Villalobos, Loco Dice, DJ Sneak, Carl Craig, Dubfire and many more. 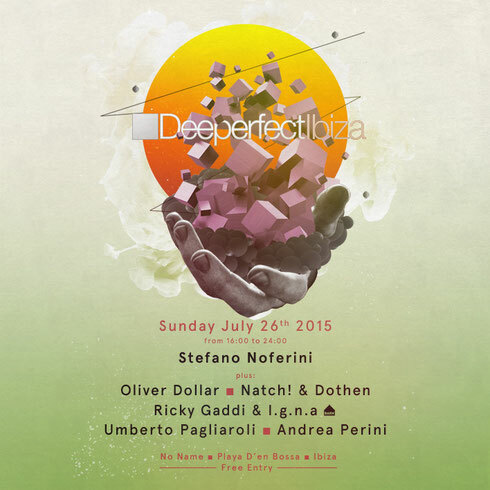 On Sunday 26 July Deeperfect will play host to Stefano Noferini, Oliver Dollar, Natch! & Dothen, Ricky Gaddi & I.g.n.a, Umberto Pagliaroli and Andrea Perini! And, it’s free entry!